Is it a PSIM, a central station platform, or an enterprise resource planning (ERP) software? Well, according to DICE, their Matrix offering is all three. While best known for providing software for central monitoring stations, they also sell end-user packages. In this note, we examine DICE Matrix, its integrations, and positioning compared to other offerings. DICE claims a wide number of system integrations. In addition to a standard fare of security/life safety integrations, the company offers a host of business operations/ accounting system integrations. The company draws no boundaries on what systems it will (attempt) to integrate with, simply stating that it's development team will integrate with 'any system, any where'. DICE hosts their PSIM. While some on-site integration is required for a 'converged' system, the company owns and operates a data center for this. With Matrix hosted in the cloud, the company installs a local client that aggregates data from the site(s) into the datacenter. However, this requires a connection between the customer and DICE which increases complexity and potentially information security risk. The cloud services DICE provides are based on its central station experience, with the facilities maintaining SAS70 and N+1 redundancy ratings. DICE claims its hosted solutions are often 'less expensive for start-ups' and that their datacenter's equipment and application management are much better maintained at DICE, and problem resolution is faster and cheaper in their datacenter, than potentially being located at customer's site. DICE provides several options for configuring the primary interface screen, with the typical GUI showing camera views on the left and the maps, reporting, or integrated system controls within tabs on the main window. Video controls are simple "VCR-style' buttons, and are primarily suited for fixed view operation. PTZ integration is model specific, and no panoramic/360 dewarping is supported at this time. DICE sells Matrix for a flat $7500 per license seat, regardless of number of cameras, doors or alarm inputs one has. Each subsystem connected (video, access, intrusion, etc.) costs an additional fee, with connections ranging in price between $5,000 to $20,000 USD. Any prerequisite enhancements to underlying systems software/ hardware is charged separately. DICE charges ~30% of the system's total value as an annual license fee. 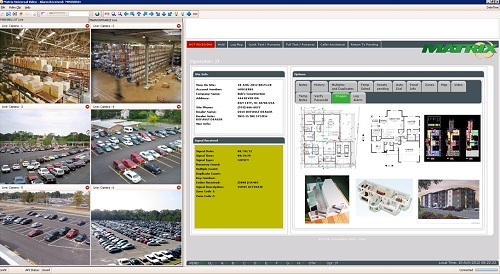 For security and alarms systems, DICE sells though integrators, but not directly to end users. When an integrator 'sells' DICE to an end user, a percentage of the licensing and maintenance fees are shared with the integrator. The exact percentage varies, and is negotiated on a case-by-case basis. DICE's two most stand out differentiators include its deep experience in managing similar large scale central station software and the relative low cost of its PSIM price structure. Assuming a mid-tier system, with three operator seats, integrating four subsystems (ie: VMS, Access Control, Asset Tracking, and Intrusion) would ballpark around $65,000, with the yearly maintenance cost billing ~$20,000. That's significantly below most PSIM providers who add in numerous charges for on site server and software components plus a per device license (which can become very expensive for sites with thousands of combined cameras, doors and alarm points. The closest comparable is likely Microsoft's PSIM. Like Microsoft, DICE Matrix has a hosted element, but the implementation of features is deeper. For example, Microsoft offers 'live view only' camera interface, where Matrix integrates with a number of recording systems. Unlike Microsoft, that charges a fee of $98,000 per year for system access, DICE charges a percentage in recurring fees. For smaller systems, DICE potentially offers a smaller total cost than other PSIM offerings. On the other hand, those looking for very large scale PSIMs for critical infrastructure may prefer more advanced functionalities at higher costs. For instance, other PSIMs offer automated workflow management based on Standard Operating Procedures, automatic adjustment of rules based on threat levels, 3D mapping, GIS overlays, integration with military style systems, etc. As a more commercially focused PSIM, DICE would likely not compare for such needs. Comments (0) : PRO Members only. Login. or Join.